I've seen where the U.S. Army has established positions for Hindu chaplains. Do any Forum members know what the new insignia looks like? I've seen that for the South African armed forces, they've also established positions for Hindu chaplains, and they have a new insignia. 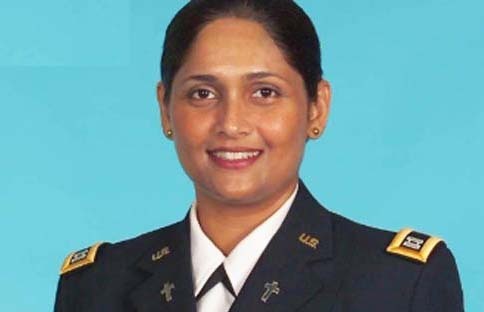 Captain Pratima Dharm is the first Hindu chaplain in the U.S. Army. Here she wears a Christian cross as a branch insignia. Here she wears some other insignia. Can anyone see what it is? CPT Dharm initially wore (the inappropriate) Christian faith Chaplain Corps branch insignia to more readily identify herself as a chaplain, bit more recently (second photo) is wearing the Staff Specialist branch insignia (the only time I have ever seen it worn). The Institute of Heraldry is currently developing a Hindu faith Chaplain Corps branch insignia. Reportedly, it will be a representation of the symbol for "Om." "Among the many tasks of establishing a new chaplaincy program was the task of establishing a new badge for future Hindu Chaplains to wear. We consulted a broad range of spiritual leaders across the nation to design the badge, including members of the White House Office of Faith-Based and Neighborhood Partnerships. The symbol "Om," which denotes truth and peace, was unanimously chosen as the new badge. Chaplain Dharm will be the first to wear this badge when approved." A possible wildcard is that there is a concern about a plethora of new chaplain badges in the army, many of which may only be worn by one or two officers. Thus, there is a proposal to design a universal chaplain badge that would be recognized by everyone, but that would also incorporate distinct emblems of faith within. I do not know if this proposal has been endorsed by Army G-1. This seems to be one of those issues that comes around on a regular basis for the U.S. Army, much like branch cords for branches other than infantry or authorizing shoulder tabs for additional courses. It would seem that a generic chaplain branch insignia would be the easy fix; however, it would seem that in keeping with tradition it would be more appropriate to use religion-specific insignia. Of course, that would mean that new insignia would need to be developed every time a new chaplain came in. Of course, that U.S. Army has a long tradition of ignoring traditions when convenient. The Hindu chaplain branch of service insignia is not yet on the TIOH website, but was approved on 5 Sept 2012. The badge is the Aum symbol in silver (nickel plated). It looks like the monogram portion only within the center of this Royal Netherlands Army Hindu chaplain badge. The US Army has also now introduced another branch insignia, this for Chaplain Candidate, which is based on the Staff Specialist branch insignia, and is nondenominational in design. Sorry to bump an old thread, but it seems strange that the Chief of Chaplains would request a "Chaplain Candidate" insignia rather than just keeping the status quo. Other officers wear the branch insignia of the specialty they have been branched into, so why not allow chaplain candidates to wear the insignia of their religion? And that is my point: they are already certified by their respective religions. The catch here is that other Army officers or soon-to-be officers begin wearing their branch insignia when they are "branched," not when they graduate OBC, as in this excerpt from http://www.norwich.edu/about/news/2005/branch.html-- "One by one, each cadet was called forward and asked to stand in front of the audience. An ROTC instructor then came up and faced the cadet while his or her branch was announced, before pinning on their insignia. For many, the moment prompted a huge sigh of relief." A similar scene happens in OCS. Why should it be any different for the Chaplain Corps (other than because the Chief of Chaplains wants it that way)? If it is a matter of saying, "Well, the current chaplain insignia isn't branch insignia, but rather religious demonination insignia," then I say to that, "Pshaw, that's only semantics." Of course, this all probably owes to the fact that chaplains are considered professionals prior to coming in, so they have a different training pipeline and different status during their training than typical officer candidates or cadets. In this day and age maybe all chaplains should wear this new insignia, considering wearing religious paraphenalia can be considered offensive by others...and the US Army is all about being inoffensive.